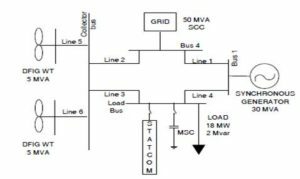 Virtual impedance, angle droop and frequency droop control play important roles in maintaining system stability, and load sharing among distributed generators (DGs) in microgrid. These approaches have been developed into three totally independent concepts, but a strong correlation exists. In this letter, their similarities and differences are revealed. Some new findings are established as follows: 1) the angle droop control is intrinsically a virtual inductance method; 2) virtual inductance method can also be regarded as a special frequency droop control with a power derivative feedback; 3) the combination of virtual inductance method and frequency droop control is equivalent to the proportional–derivative (PD) type frequency droop, which is introduced to enhance the power oscillation damping. These relationships provide new insights into the design of the control methods for DGs in microgrid. Fig. 1 Equivalent output voltage source considering virtual impedance. Fig. 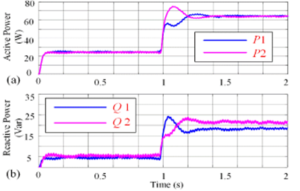 2 Power response during load change in conventional frequency droop. (a) Active power, (b) reactive power. Fig. 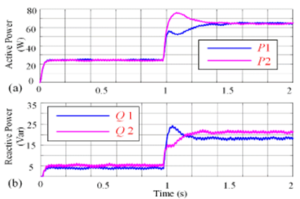 3 Power response during load change in frequency droop plus virtual reactance. (a) Active power, (b) reactive power. Fig. 4 Power response during load change in modified frequency droop. (a) Active power, (b) reactive power. 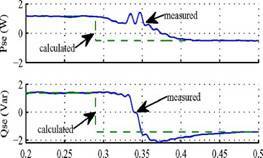 This letter compares the similarities and differences among three different concepts, virtual impedance method, angle droop and frequency droop control. Although each of them has been well researched, new perspectives are bought to readers by relating all three together. Thus, the inherent relationships are established, and new insights into the controller design are provided. Finally, the modified droop control unifies these three independently developed droop control methods into a generalized theoretical framework. To the reader, this letter explores the possibilities of further enhancing the existing methods and inspiring the development of new methods. 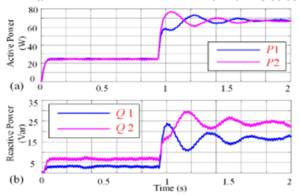 M. Guerrero, L. GarciadeVicuna, and J. Matas, “Output impedance design of parallel-connected UPS inverters with wireless load-sharing control,” IEEE Trans. Ind. Electron., vol.52, no.4, pp.1126-1135, Aug.2005. 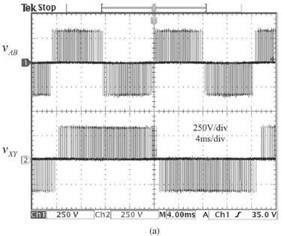 He and Y. Li, “Analysis, design, and implementation of virtual impedance for power electronics interfaced distributed generation,” IEEE Trans. Ind. Appl., vol.47, no.6, pp. 2525-2538, Nov. 2011. 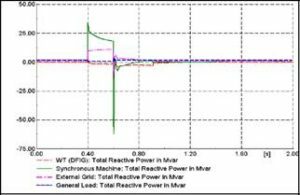 Mahmood, D. Michaelson, and J. Jiang, “Accurate reactive power sharing in an islanded microgrid using adaptive virtual impedances,” IEEE Trans. Power Electron., vol.30, no.3, pp. 1605-1617, Mar.2015. Majumder, G. Ledwich, A. Ghosh, S. Chakrabarti, and F. Zare, “Droop control of converter-interfaced microsources in rural distributed generation, ” IEEE Trans. Power Del., vol. 25, no. 4, pp.2768-2778, Oct. 2010. 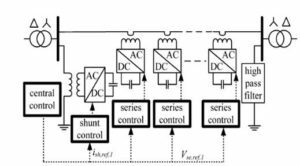 C, Chandorkar, D. M. Divan, and R. Adapa, “Control of parallel connected inverters in standalone ac supply systems,” IEEE Trans. Ind. Appl., vol.29, no.1 pp.136-143, Jan.1993. Frequency control in autonomous microgrids (MG) with high penetration of renewable energy sources represents a great concern to ensure the system stability. In this regard, this paper presents an enhanced control method for battery energy storage systems (BESS) to support the frequency of MG and with the ability of disconnecting from the MG to supplying in the island mode a local consumer. 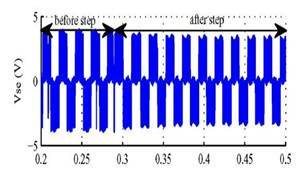 A frequency controller, combining a conventional droop control with an inertia emulation function, governs the BESS active power transfer during the primary frequency control level. The BESS may also provide voltage support in the point of common coupling with the MG. 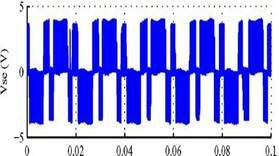 Moreover, the proposed BESS may compensate, partially or totally, the power absorbed by the local loads in order to improve the MG frequency response. When the MG power quality worsens below a certain level, in terms of voltage and frequency, the BESS detaches from the MG and continues to operate islanded. The reconnection is accomplished following a smoothly resynchronization of the local voltage with the MG, without disturbing the local loads supply. Additionally, this paper also discusses about the aspects related to the BESS management and its integration within the proposed system. The simulation and experimental results assess the feasibility of the proposed control solutions. Frequency control in autonomous microgrids (MG) with high penetration of renewable energy sources represents a great concern to ensure the system stability. In this regard, this paper presents an enhanced control method for battery energy storage systems (BESS) to support the frequency of MG and with the ability of disconnecting from the MG to supplying in the island mode a local consumer. 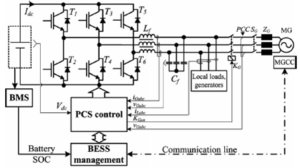 A frequency controller, combining a conventional droop control with an inertia emulation function, governs the BESS active power transfer during the primary frequency control level. The BESS may also provide voltage support in the point of common coupling with the MG. Moreover, the proposed BESS may compensate, partially or totally, the power absorbed by the local loads in order to improve the MG frequency response. When the MG power quality worsens below a certain level, in terms of voltage and frequency, the BESS detaches from the MG and continues to operate islanded. The reconnection is accomplished following a smoothly resynchronization of the local voltage with the MG, without disturbing the local loads supply. Additionally, this paper also discusses about the aspects related to the BESS management and its integration within the proposed system. The simulation and experimental results assess the feasibility of the proposed control solutions. Fig. 2. MG frequency (Top) and BESS active power (Bottom) for different operating conditions (simulation results). This paper presented a Battery Energy Storage Systems BESS mainly designed to provide frequency support in MG, but having special control features. The BESS can operate both connected to the MG (G-mode) or in (I-mode), whereas the transition between the two states is seamlessly coordinated by an original control method. The BESS may serve local sensitive consumers connected on the local bus, by including special control functions to protect them in adverse MG operating conditions. The BESS management is also taking into discussion from the perspective of its influence upon the proposed controller performance. Simulations and experimental results were provided to validate the proposed BESS. 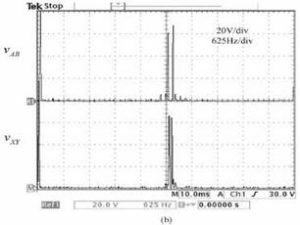 An improved frequency controller, with conventional droop and virtual inertia was proposed and in the simulation results, it proved to be an efficient solution, resulting in faster damping of the MG frequency oscillations. 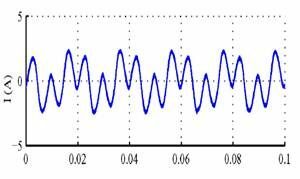 Moreover, by partially or totally compensating the local loads, the MG is relieved by the corresponding power disturbance produced by their stochastic operation and thus the MG frequency deviation can be diminished. By this approach, the BESS along with the local loads may be considered as a sort of smart load. 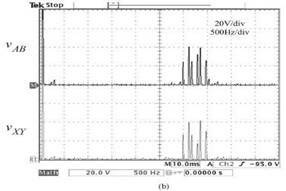 The transition between G-mode to I-mode took place when the PCC power quality worsened and the experimental results showed a clean transfer without important voltage and frequency variations. The transition between I-mode to G-mode included a smoothly synchronization period of the local voltage with the MG voltage, after which the switching to G-mode did not disturb either the local loads or the MG. During I-mode, the local loads are supplied directly by the BESS and the presented experimental results including a comprehensive operating case, proved that the voltage control quality falls into the required standards. Future studies are intended to be carried out on the system availability to contribute to the MG power quality improvement. Bevrani, A. Ghosh, and G. Ledwich, “Renewable energy sources and frequency regulation: Survey and new perspectives,” IET Renew. Power Gen., vol. 4, no. 5, pp. 438–457, Sep. 2010. Tan, Q. Li, and H. Wang, “Advances and trends of energy storage technology in Microgrid,” Int. J. Elect. Power Energy Syst., vol. 44, no. 1, pp. 179–191, Jan. 2013. Bottrell, M. Prodanovic, and T. C. Green, “Dynamic stability of a microgrid with an active load,” IEEE Trans. Power Electron., vol. 28, no. 11, pp. 5107–5119, Nov. 2013. A. P. Lopes, F. J. Soares, and P. M. R. Almeida, “Integration of electric vehicles in the electric power system,” Proc. IEEE, vol. 99, no. 1, pp. 168–183, Jan. 2011. Injection of the wind power into an electric grid affects the power quality. The performance of the wind turbine and thereby power quality are determined on the basis of measurements and the norms followed according to the guideline specified in International Electro-technical Commission standard, IEC-61400. The influence of the wind turbine in the grid system concerning the power quality measurements are-the active power, reactive power, variation of voltage, flicker, harmonics, and electrical behavior of switching operation and these are measured according to national/international guidelines. The paper study demonstrates the power quality problem due to installation of wind turbine with the grid. In this proposed scheme STATic COMpensator (STATCOM) is connected at a point of common coupling with a battery energy storage system (BESS) to mitigate the power quality issues. The battery energy storage is integrated to sustain the real power source under fluctuating wind power. The STATCOM control scheme for the grid connected wind energy generation system for power quality improvement is simulated using MATLAB/SIMULINK in power system block set. The effectiveness of the proposed scheme relives the main supply source from the reactive power demand of the load and the induction generator. The development of the grid co-ordination rule and the scheme for improvement in power quality norms as per IEC-standard on the grid has been presented. Fig.1.System operational scheme in grid system. Fig. 1. Three phase injected inverter Current. Fig. 2. (a) Source Current. (b) Load Current. (c) Inverter Injected Current. 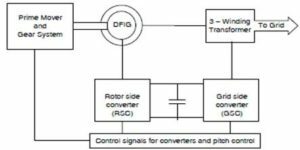 (d) Wind generator (Induction generator) current. Fig. 3. (a) DC link voltage. (b) Current through Capacitor, STATCOM output voltage. Fig. 5. Supply Voltage and Current at PCC. Fig.6. (a) Source Current. (b) FFT of source current. 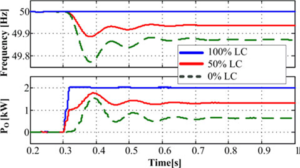 The paper presents the STATCOM-based control scheme for power quality improvement in grid connected wind generating system and with non linear load. The power quality issues and its consequences on the consumer and electric utility are presented. 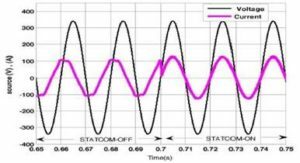 The operation of the control system developed for the STATCOM-BESS in MATLAB/SIMULINK for maintaining the power quality is simulated. It has a capability to cancel out the harmonic parts of the load current. It maintains the source voltage and current in-phase and support the reactive power demand for the wind generator and load at PCC in the grid system, thus it gives an opportunity to enhance the utilization factor of transmission line. The integrated wind generation and STATCOM with BESS have shown the outstanding performance. Thus the proposed scheme in the grid connected system fulfills the power quality norms as per the IEC standard 61400-21. Sannino, “Global power systems for sustainable development,” in IEEE General Meeting, Denver, CO, Jun. 2004. S. Hook, Y. Liu, and S. Atcitty, “Mitigation of the wind generation integration related power quality issues by energy storage,” EPQU J., vol. XII, no. 2, 2006. Billinton and Y. Gao, “Energy conversion system models for adequacy assessment of generating systems incorporating wind energy,” IEEE Trans. on E. Conv., vol. 23, no. 1, pp. 163–169, 2008, Multistate. Manel, “Power electronic system for grid integration of renewable energy source: A survey,” IEEE Trans. Ind. Electron., vol. 53, no. 4, pp. 1002–1014, 2006, Carrasco. When integrated to the power system, large wind farms can pose voltage control issues among other problems. A thorough study is needed to identify the potential problems and to develop measures to mitigate them. Although integration of high levels of wind power into an existing transmission system does not require a major redesign, it necessitates additional control and compensating equipment to enable (fast) recovery from severe system disturbances. The use of a Static Synchronous Compensator (STATCOM) near a wind farm is investigated for the purpose of stabilizing the grid voltage after grid-side disturbance such as a three phase short circuit fault. 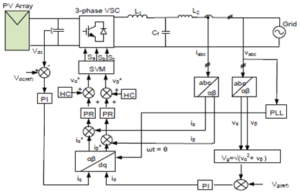 The strategy focuses on a fundamental grid operational requirement to maintain proper voltages at the point of common coupling by regulating the voltage. The DC voltage at individual wind turbine (WT) inverters is also stabilized to facilitate continuous operation of wind turbines during disturbances. Fig. 5. 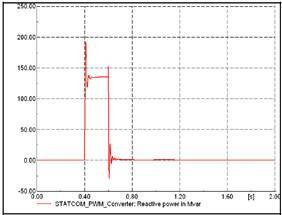 Reactive and active power of the 25 MVA STATCOM for Case 3, AC and DC busbar voltages of the STATCOM for Case III. Fig. 6. Reactive and active powers of only the STATCOM for Case 4, Reactive power and terminal voltage of only the the MSC for Case 4. Fig. 8. 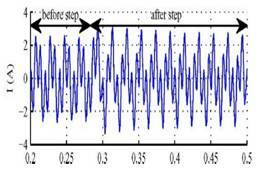 Reactive power of the 125 MVA STATCOM for Case 5. Wind turbines have to be able to ride through a fault without disconnecting from the grid. When a wind farm is connected to a weak power grid, it is necessary to provide efficient power control during normal operating conditions and enhanced support during and after faults. 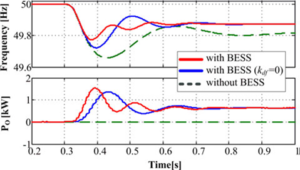 This paper explored the possibility of connecting a STATCOM to the wind power system in order to provide efficient control. An appropriately sized STATCOM can provide the necessary reactive power compensation when connected to a weak grid. Also, a higher rating STATCOM can be used for efficient voltage control and improved reliability in grid connected wind farm but economics limit its rating. 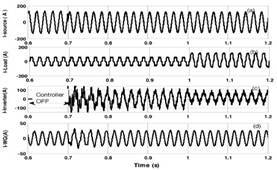 Simulation studies have shown that the additional voltage/var support provided by an external device such as a STATCOM can significantly improve the wind turbine’s fault recovery by more quickly restoring voltage characteristics. The extent to which a STATCOM can provide support depends on its rating. The higher the rating, the more support provided. The interconnection of wind farms to weak grids also influences the safety of wind turbine generators. Some of the challenges faced by wind turbines connected to weak grids are an increased number and frequency of faults, grid abnormalities, and voltage and frequency fluctuations that can trip relays and cause generator heating. http://www.awea.org/newsroom/releases/Wind_Power_Capacity_012307. html, accessed Nov. 2007. Sun, Z. Chen, F. Blaabjerg, “Voltage recovery of grid-connected wind turbines with DFIG after a short-circuit fault,” 2004 IEEE 35th Annual Power Electronics Specialists Conf., vol. 3, pp. 1991-97, 20-25 June 2004. Muljadi, C.P. Butterfield, “Wind Farm Power System Model Development,” World Renewable Energy Congress VIII, Colorado, Aug- Sept 2004. M. Muyeen, M.A. Mannan, M.H. Ali, R. Takahashi, T. Murata, J. Tamura, “Stabilization of Grid Connected Wind Generator by STATCOM,” IEEE Power Electronics and Drives Systems Conf., Vol. 2, 28-01 Nov. 2005. Saad-Saoud, M.L. Lisboa, J.B. Ekanayake, N. Jenkins, G. Strbac, “Application of STATCOMs to wind farms,” IEE Proceedings – Generation, Transmission, Distribution, vol. 145, pp.1584-89, Sept 1998. 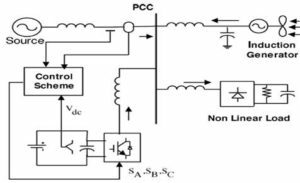 This paper presents a new component within the flexible ac-transmission system (FACTS) family, called distributed power-flow controller (DPFC). The DPF Controller is derived from the unified power-flow controller (UPFC). The DPFC can be considered as a UPFC with an eliminated common dc link. 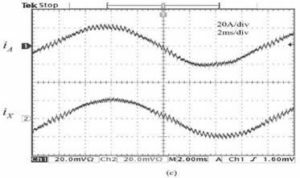 The active power exchange between the shunt and series converters, which is through the common dc link in the UPFC, is now through the transmission lines at the third- harmonic frequency. 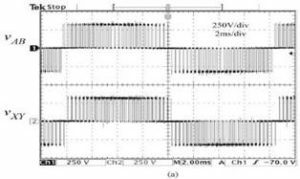 The DPFC employs the distributed FACTS (D-FACTS) concept, which is to use multiple small-size single-phase converters instead of the one large-size three-phase series converter in the UPFC. The large number of series converters provides redundancy, thereby increasing the system reliability. As the D-FACTS converters are single-phase and floating with respect to the ground, there is no high-voltage isolation required between the phases. Accordingly, the cost of the DPFC system is lower than the UPFC. 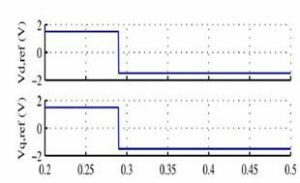 The DPFC has the same control capability as the UPFC, which comprises the adjustment of the line impedance, the transmission angle, and the bus voltage. The principle and analysis of the DPFC are presented in this paper and the corresponding experimental results that are carried out on a scaled prototype are also shown. Fig. 1. DPFC control block diagram. Fig. 2. 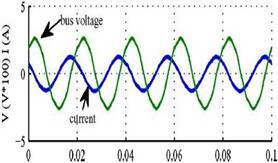 DPFC operation in steady state: line current. Fig. 3. DPFC operation in steady sta te:series converter voltage. Fig. 7. Step response of the DPFC: linecurrent. voltage. Fig. 8. 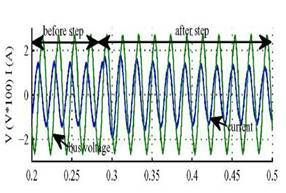 Step response : active and reactive power injected by the series converter at the fundamental frequency. 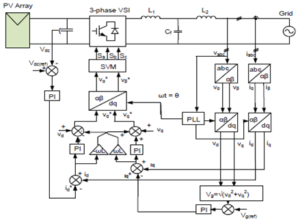 This paper has presented a new concept called Distributed power flow controller. 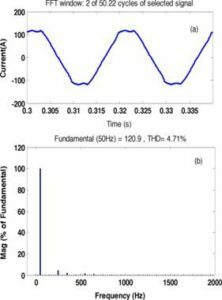 It emerges from the UPFC and inherits the control capability of the UPFC, which is the simultaneous adjustment of the line impedance, the transmission angle, and the bus-voltage magnitude. The common dc link between the shunt and series converters, which is used for exchanging active power in the UPFC, is eliminated. This power is now transmitted through the transmission line at the third-harmonic frequency. The series converter of the DPFC employs the D-FACTS concept, which uses multiple small single-phase converters instead of one large-size converter. The reliability of the DPFC is greatly increased because of the redundancy of the series converters. The total cost of this controller is also much lower than the UPFC, because no high-voltage isolation is required at the series-converter part and the rating of the components of is low. The DPFC concept has been verified by an experimental setup. 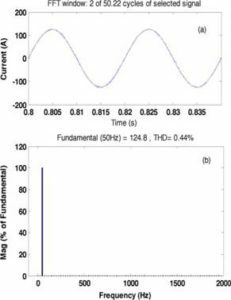 It is proved that the shunt and series converters in the DPFC can exchange active power at the third-harmonic frequency, and the series converters are able to inject controllable active and reactive power at the fundamental frequency. -H. Song and A. Johns, Flexible ac Transmission Systems (FACTS) (IEE Power and Energy Series), vol. 30. London, U.K.: Institution of Electrical Engineers, 1999. 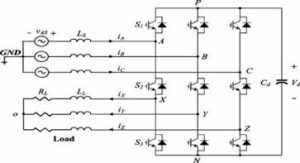 G. Hingorani and L. Gyugyi, Understanding FACTS : Concepts and Technology of Flexible AC Transmission Systems. New York: IEEE Press, 2000. Gyugyi, C.D. Schauder, S. L.Williams, T. R. Rietman,D. R. Torgerson, andA. Edris, “The unified power flowcontroller:Anewapproach to power transmission control,” IEEE Trans. Power Del., vol. 10, no. 2, pp. 1085–1097, Apr. 1995. -A. Edris, “Proposed terms and definitions for flexible ac transmission system (facts),” IEEE Trans. Power Del., vol. 12, no. 4, pp. 1848–1853, Oct. 1997. 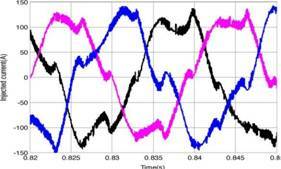 K. Sen, “Sssc-static synchronous series compensator: Theory, modeling, and application,” IEEE Trans. Power Del., vol. 13, no. 1, pp. 241–246, Jan. 1998.